Faster, cheaper, smaller, better, right? 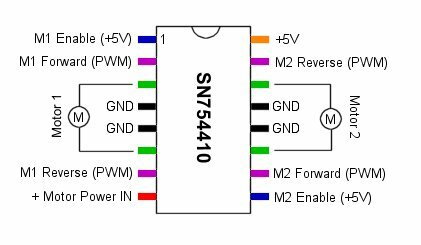 The SN754410 Quad Half H-Bridge is just that. Capable of driving high voltage motors using TTL 5V logic levels, the SN754410 can drive 4.5V up to 36V at 1A continuous output current! For even higher current applications, it is possible to physically stack two devices on top of each other to get almost 2 A of drive current. The SN754410 is a quad half H-bridge IC. 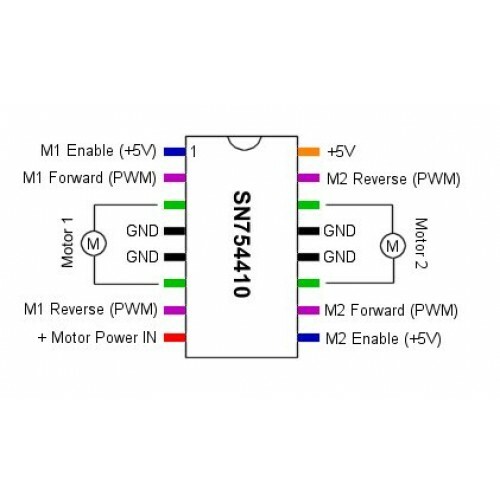 This allows the chip to either control 4 motors in one direction using the 4 half H-bridges or to control 2 motors in both directions using a full H-bridge for each motor. The following shows the connections for controlling 2 motors in either direction using 2 full H-bridges. 1 1,2EN Motor 1 Enable Setting this pint o 0V (LOW) will turn off the motor, setting it to 5V (HIGH) will enable the motor. 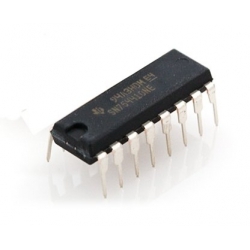 Connect this pin to the 5V supply, or use as an emergency shutoff. 9 3,4EN Motor 2 Enable Setting this pint o 0V (LOW) will turn off the motor, setting it to 5V (HIGH) will enable the motor. 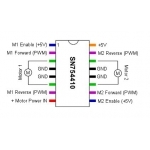 Connect this pin to the 5V supply, or use as an emergency shutoff.